Car boot sales are becoming popular and it’s a fun way to make some money and get rid of any old tat lying around your house. Not only is it a great source of superb bargains, it’s also a fun way to socialise and meet new people. Take advantage of this and get down to a car boot sale and start making some extra money! Here’s my guide to practical car boot sale buying and selling. 1. Do market research to suss out how certain venues work. Sometimes there are restrictions on the sale of certain goods such as knives, medicines etc. 2. Think about how you’re going to display your items. Remember presentation can make or break your sale. You should also try to re- position your items several times throughout the day, this will create a different looking section and buyers will notice. 3. Don’t put prices up to high, this will deter buyers. Items under €4 will sell quickly. Anything over €10 will sell slowly. It may also be a good idea to consider concessions for students. 4. Know what sells. Get an idea of what’s popular. Electronics such as mobile phones, children’s toys, clothing, jewellery, DVD’S prove to be quite popular as well. 5. Have some nibbles/tasters/sweets to attract the buyers. 6. Avoid making eye contact with buyers while they are browsing, it can make people feel uneasy. People tend to rummage if they’re not being watched, so bring a book along. 7. Put price tags on your items. 8. Keep a plastic sheet over your display before people come in, that way the car boot organizers don’t snap up bargains that are there for the public. 9. Be prepared to haggle. 10. 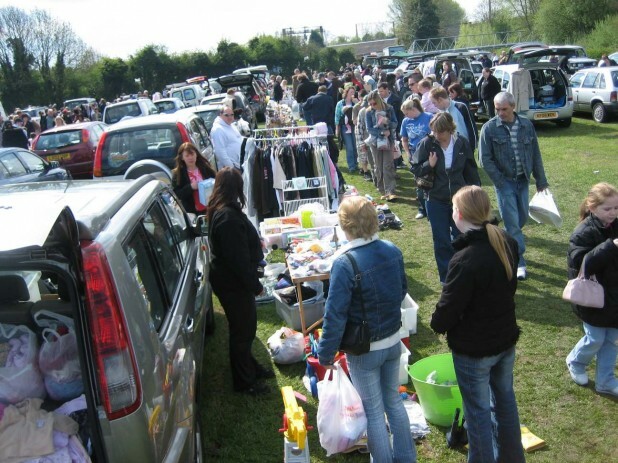 Watch your expensive items- car boot sales can be a magnet for thieves, so keep an eye out. 11. Make sure to take some change, have a few coins and notes. 12. Take a chair, wet wipes, umbrella, boxes marked with fixed prices and carrier bags for buyers. If you’re selling clothes, bring a clothes rail and if possible a mirror. 13. Never leave your stall unattended. It would be a good idea to bring a helper along. 1. Be prepared to turn up early if you want to find the best bargains. 2. Decide what you are looking for before you arrive, otherwise all you will see is a display of junk! 3. Train your eye to look under, around and past the sellers table to avoid missing out on better items. 4. Make sure you haggle! Sellers tend to overprice their items. Don’t be afraid to ask for a discount if you’re buying multiple items from one seller. 5. Be prepared to walk around the car boot sale a second time, as sellers tend to change their display several times throughout the day, which may uncover something interesting. 6. Not all stall holders provide carrier bags, so make sure to bring a carrier bag or a rucksack. 7. Depending on weather conditions make sure to dress appropriately, rain jackets and comfortable footwear. 8. It would be useful to bring along measuring tape if you’re planning on buying clothing to ensure if fits properly. 9. Avoid bringing note’s, carry coins as many sellers tend to run out of change. – Counterfeit and fake goods are illegal, avoid at all costs. When buying genuine CD’S and DVD’S, look out for any scratched or missing discs from the sleeves. – Electrical goods in some cases may be stolen or broken. Make sure to take the buyers name and phone number and agree on a refund if the item isn’t working. – Book’s; make sure to leaf through books in case some pages are missing. Good post. Which one is the best for dodgy dvds? The Dublin Flea Market need to get a grip.Charging eu40 for a stall!!! !what planet are they on,markets in meath for less than a tenner.Are they still going,wouldnt be surprised if they weren’t.typical rip off ireland.eu40?????????? i agree how on earth would you pay 40e and still do well your going to be out of pocket cold wet and prob sell 20e euro wort of stuff that cost 70e in the first place so 90e for the dy with another 40e for the doctor to say you have the flu is 130e then 7.50e to get your script and 25e for the petrol running around to get yer stuff ready out set up back ect so thats 162.50e out of pocket and all because some toe rag can take your 40e for a parking spot that should be free in the first place people are not going out selling there stuff in the cold because we want to its because we have to so hob nobs remember this were in a recession but this would prob put you in a depression drop to 10e or you wont have a market to go to we will all run down the bog! Event data: Tuesday, 25th of November 2014. Ticket : Vendors – €5 per table. Public – free entrance. All proceeds will go to charity ~ Irish Cancer Society. Toilets on site and parking . Hi I have a large selection of kids clothes ladies and gents over 150 items ideal for car booth sale €3 item mostly designer stuff doing a clear out. Hi Susan,Have you sold your kids clothes?